deal for switch rods, the Hydros HD switch line features our newest textured line technology for the ultimate in line speed, shootability and floatation. Comfortable to cast overhand, single or double hand, and to execute a variety of spey casts. Crafted around an exclusive Orvis taper, it features a 34-foot head with a moderate length front taper and compact back taper. Color change along the entire back taper aids the caster in determining the 'sweet spot' for a particular setup. 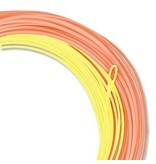 To help maximize performance, combine this line with one of our 10' salmon/steelhead polyleaders (1R5K). HD texturing provides increased surface area, allowing the line to sit higher in the water, offering less drag, easier mending, less water spray, and easier pick-ups. The micro-textured surface traps air to provide increases in both shootability and flotation while decreasing friction, and the microreplicated pattern increases line durability.